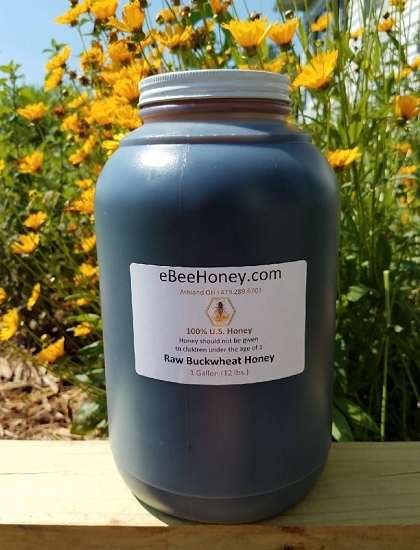 Raw Buckwheat Honey in a 1 gallon container which is 12 pounds of honey. We typically will have both liquid and crystallized versions - this is due to different hive locations. Some buckwheat will crystallize quicker than others, no rhyme or reason, it's the nature of honey. We do not alter the honey in anyway. Raw buckwheat honey in a 1 gallon container which is 12 pounds of honey. Raw honey has not been heated and simply filtered through a large mesh screen. The screen removes larger particles and allows pollen, propolis and beeswax particles to pass through it. Buckwheat honey is pungent in flavor with molasses and malty tones and a lingering aftertaste. Buckwheat honey is also very dark in color. Best Honey by Great Company! This is my third order!Will keep buying more! Great product!!!! High quality honey!!! I have been buying honey from the great beekeepers at EBEEHONEY for a number of years. I am enthralled by their Raw Buckwheat! So much so that I order a gallon of it about every four months. The aroma is a delicious combination of scents from the sweetness of the honey itself, to the notes of buckwheat that are the hallmark of this strain of honey. The taste is strong, which I like very much, and the taste, sublime that it is, lingers for a while in the mouth after having some in my Hot Instant Oatmeal. The darker honey varieties have been found to help reduce cholesterol levels in the blood, which can help heart health and even lower high blood pressure. It is also great for soothing coughs from a cold. I cannot say enough good words about EBEEHONEY, or the fine Buckwheat Honey that they sell. I am a client for life! Thank You! I have been purchasing this exact honey for awhile, it's great for my coffee, and anything else I want to replace package sugar with. I love honey and in particular - good honey. All untreated honey will crystalize and if you keep around a long time - that is fine. Honey was found in the tombs of Egyption kings and royality and was still in edible condition when the tombs were opened. No need to worry that your honey will spoil either. This buckwheat flavor is exquisite. Some folk say buckwheat honey will cure a cold. I just love all the different flavors and kinds of honey there are. I'm happy to find a quality provider for my liquid gold. This buckwheat honey is not as sweet as clover honey however it is addictive. I hav found my new honey it is dark and rich. I am always pleased with the products and service at ebeehoney. I have been buying honey here for a few years now and will continue to do so. THANK YOU, keep up the good work. I have been a customer of ebeehoney.com for close to 15 years. Their customer service and products have always been top knotch. I especially love the Raw Buckwheat honey, always fresh and is considered a "super food". Your request for a review sounds like I purchased One ( 1 gallon wide mouth container) of Raw Buckwheat Honey. Actually this last order was for Two (1gallon containers) of the Raw Buckwheat. I placed this order one day early to midweek and received it the very next day! I live in the very north east corner of the state of Ohio. eBee Honey is located in Ohio somewhere but not anywhere close to me so they must have shipped it the same day they received my order. The 2 large containers came in 1 box packed well with ample protection of large styrofoam peanut-like cushioning. I love this honey and I never buy from the grocery store anymore. Buckwheat is my favorite but I have bought at least half a dozen different varieties in the past including the creamed honey,honey comb, chunk and Royal Honey and Propolis over the last 3-5 years. While all are delicious and the Raw the most nutritious I especially love the Buckwheat, and even better when it chrystalizes. The gritty texture gives a sugary feel in my mouth. I give eBee Honey a Five Star Rating! Thank you for a healthy delicious product and very fast service. your product is excellent i'm very satisfied. your website is excellent. very professional and well thought out. i'm drinking a cup of honey and hot water right now.the honey arrived right on time. i'm ordering the bamboo after I write this review.i apologize for using all small letters.lol. So happy with my first purchase, just recently learned alot about honey and was concerned of were honey is coming from. Nothing is better and safer than buying from bee farm. The taste is out of this world will never buy store bought again. Another fine product, just as expected ! Very good tasting honey, fast shipping and I received it in good condition. Quality products with great processing standards still consistently upheld. After Manuka honey from New Zealand,which is around $50 per lb., raw buckwheat honey is a close second. I love this honey because of its distinctive pungent taste, very dark amber color, high anti oxidant content and unique strong aroma. I had ordered a gallon of it which had been damaged in UPS shipping, but ebee honey sent me another gallon at no charge (they even covered the shipping cost as well.) Best honey I have ever had. Wonderful! The best honey I have ever had. It has strong taste which I like, but it might be a bit too strong for those who prefer light taste such as their wildflower honey. in fact, all of their raw honey are great! Their price is very reasonable. 5 stars for the customer service as well. It is an outstanding product. Exceptional taste. We consume it very quickly and plan to purchase more of it and also of other varieties. We are very happy that discovered this store! I purchase a Gallon of RAW Buckwheat Honey few months ago. This honey is not pure rather it contains high amount of Molasses and it smells very bad. This was my first time ordering from ebeehoney.com, I will never order again. eBeeHoney reply to: Jamshaid, sorry to hear you didn't like the buckwheat honey - it's a very strong smelling honey as customers tell us they either really like it or find it very strong tasting and strong smelling - not their favorite. We do hear it tastes like molasses due to the strong taste it has and also the color and thickness of it. We've heard customers who state it smells like a horse barn and they love it! It is 100% pure buckwheat honey and nothing is added to it - it also has great health benefits. I always buy my honey from Ebee Honey because it is reasonably priced and great quality. The buckwheat honey is earthy and sweet. I ALWAYS buy my honey from eBee Honey because it is reasonably priced and great quality. The buckwheat honey is earthy and sweet, with pungent aroma. This is the first time I purchased from Ebeehoney and I was definitely happy with the service. This honey shipped the same day I purchased it and was here in a few days. Now for the honey review. I have never tried buckwheat before today, and I have read many mixed reviews. I was planning on making a nice dark mead with this honey, but after tasting it, I think I need to by another 12 pounds just for myself. The honey is so dark, thick and rich tasting. It is malty and unlike any honey I have tasted. I am impressed with this honey, and will continue to buy from Ebeehoney from now on, and look forward to trying some of the other varieties. Thanks again for the great product. Very nice buckwheat honey, going to make some very good mead with it. Great product. High quality thick honey. Much better than my local source. Very quick shipping. The honey came super quick. We were all so excited to try it. This is the first time that we bought buckwheat from them. I was not disappointed. The honey was thick, with a strong flavor. My sore throat felt better quickly. It is not as sweet as other kinds of honey but the flavor is so rich! The best honey I have tasted. The texture and taste is amazing. Bought different kinds of honey online and stores, but Nothing compares to this one. This is an excellent high quality product AND I ordered on one day & received it on the next day..Before Noon!! Been using Ebee Buckwheat honey for years. I've also looked for similar honey at every Farmers' Market I've been to with no success. Buckwheat honey tastes full, rich, and slightly malty but it's not too sweet. A good comparison is the difference between light and dark beer. One of the things I like best about this honey is that although it tastes in general the same each year, it's not the same even from the top of the jar to the bottom. I love that, but some may want consistency like what comes from the grocery store. I also used it very recently in tea to relieve abdominal cramping from food poisoning. I am saving the last little bit of honey from last year because it crystalized and I can shave off a sliver with a spoon and it's a yummy treat. I will buy this honey from this company until they no longer sell it. I thought, based on descriptions, that raw buckwheat honey would taste a bit like molasses, but unfortunately, mine did not. Didn't taste bad, or have any strong taste, actually, it was just OK. It was decent honey and lasted well. Did eventually crystallize, but not really hard, and not a big deal. and price was very good. I have bought buckwheat honey from many different places. The honey from here was delivered very fast, and very well packed. The flavor and consistency is by far better than I have had in a long time. I will be ordering again soon as it goes way to fast. Thank you and GOD Bless! ordered a 12lb jar of raw crystallized buckwheat. Arrived with less than half crystallized - not the product I ordered. The rest is very runny and liquidy - in I've fact never seen buckwheat honey that runny. Also never seen it crystallizing this way: been buying local honey for 30+ years: honey usually crystallizes uniformly, not half liquid, half in large grains. I bought this same honey a couple months back in a 2.5lb jar - that one was much thicker and crystallized fast. This one simply doesn't look or taste like honey. 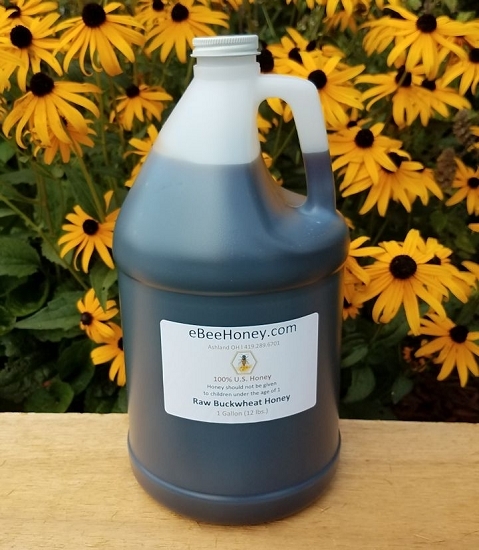 eBeeHoney's buckwheat honey is pungent in flavor with molasses and malty tones and a lingering aftertaste. This is my fourth gallon of buckwheat honey that I have purchased from ebeehoney. I use primarily for tea and beverages. Excellent flavor, the entire family enjoys this honey. I tried this honey after seeing the health benefits of Buckwheat honey and that it helps with coughs. I use it with hot lemon water, in other drinks, and also to make peanut butter energy bars. It tastes great too! I love the stronger taste of the buckwheat honey. To strong of a flavor for my wife and kids, but they love the wildflower honey. Great service. As always, the raw buckwheat honey is absolutely delicious and makes my tea taste excellent. I have asthma, so it helps my cough immensely. Best honey ever. Taste is rich and flavorful. Mixed with warm water (no hotter than 104°) and lemon juice, it's bee medicine in our house and we swear by it to keep us all healthy. The customer service was prompt via email when I had questions and concerns. The product is excellent, and the Raw Buckwheat honey is darker and very flavorful. I've been using honey in my coffee for years. Then I discovered raw buckwheat honey--even better. Then I discovered ebee some years back. They are the best. I cut my honey bill in half buying from them in bulk. The shipments get here fast and they are on the ball. Once I ordered the wrong thing and they called me up to straighten it out--wow! Thank you ebee honey. The buckwheat honey is exactly as it's described, it's rich flavor, molasses, and malty. If you like full flavor like I do you will love this honey! I'm going through it so fast I'll be reordering sooner than later.